It’s 150 years ago this month that the ‘Great Tea Race’ of 1866 ended in London with the clipper ship Taeping taking the honours followed just 28 minutes later by the Ariel. The race, which had started in China, was part of a tradition for ships carrying cargoes of tea from the east to engage in a race to be the first to dock in London – and quite a lucrative one, for it was common for the first ship to arrive to receive a premium of at least 10 per cent (although 1866 was apparently the last time this was offered). At least 57 ships apparently sailed in the 1866-67 ‘tea season’, departing for Britain from a range of ports including Shanghai, Canton and Hong Kong. But it was the fastest which gathered the most attention – these chosen clippers set sail for Britain from the Min River, downriver from Foochow (now Fuzhou), in late May, 1866. As well as the Taeping, launched in 1863 and captained by Donald MacKinnon, and the Ariel, launched only the previous year and captained by John Keay, other favourites in the 1866 race included Fiery Cross, Serica and Taitsing. 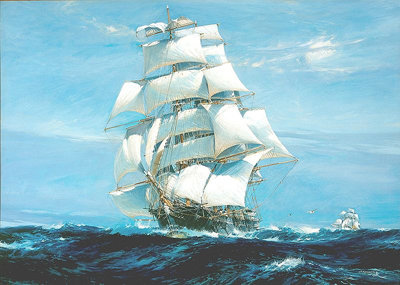 The race was followed breathlessly in the London press although details were limited – largely due to the time it took for the news to reach London – as the ships set a course which took them through Indonesia via the Sunda Strait and around the southern tip of Africa and up via the Atlantic to the UK. The Taeping, the race winner, reached London Docks at 9.47pm on 6th September while Ariel arrived at the East India Dock at 10.15pm. The Serica, meanwhile, reached West India Docks at 11.30pm. (It wasn’t to be too unfortunate for the runner-up – Captains McKinnon and Keay had apparently agreed to split the premium of 10 shillings a ton). Amazingly, this means the three ships – which had all left China on the same tide – had sailed more than 14,000 miles in a race of 99 days yet had managed to dock with just two hours between them.